This Thursday at Red Candy we’ve been celebrating the importance of Tea in our lives, and how big a part of us culturally and spiritually – from Afternoon Tea to Tea Leaf reading it’s been a big part of our lives for so long, it’d be hard to imagine life without it! So, today we’ve been trawling the depths of the internet to find some of the quirkiest and interesting teapots and tea services, enjoy! 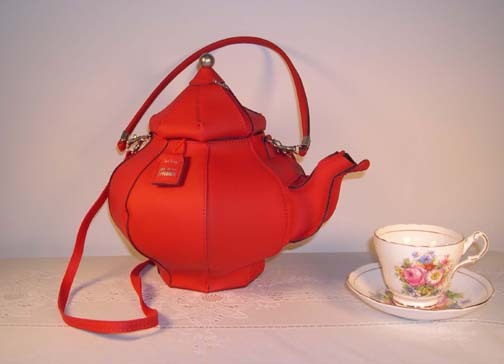 Teapot Handbag – For the tea lovers on the go! Untitled by Todd Burns – A very chunky, industrial feel gives this stocky teapot a big presence with a heightened copper and steel handle. VERA Electrical Kettle by Casa Bugatti – For lovers of everything sleek, chic and modern! Vintage Napkin Holder teapot – This gorgeous little piece is made from a lucite plastic resin and comes with it’s very own built in napkin holder, also useful when picking up a hot teapot! Techinically not a designer kettle, but I just couldn’t resist slipping this one in! This unusual little piece was inspired by marine life, and is actually covered in little ceramic barnacles! Cigno by Adam Hammerman – This quirky little design will have all the hens clucking, with it’s intense deep red body and beautifully delicate swan-neck. Creativi*tea by Sarina Fiero – Why not bring some creativi*tea to your afternoon tea with this very sleek designed kettle, which even changes colour when your water is ready ! Alice by Rachel Boxnboim – This adorable little tea service from the mind of Israeli designer Rachel Boxnboim was made by casting ceramic inside a fabric mould so it retained all the details form the fabric including the stitches and seams! This quaint little tea service is of Japanese origin, and is made of cast iron. Sorapot – This amazing futuristic kettle actually has a pyrex cylinder in the middle of the kettle, which allows you to watch as your tea steeps, making the process just as exciting as the outcome! Need a Red Sofa? Foliage by Patricia Urquiola!